Protected areas are a national measure aimed at preserving valuable natural features and in-situ biodiversity. The proportion of protected areas increased by ca. 3.4% percent in 2002 and 2003 because of the foundation of the Notranjska Regional Park and the Goričko Landscape Park, while since 2004 the share of the protected areas, which amounts to about 12%, has not changed considerably. The indicator shows the surface area of protected areas in Slovenia with regard to the type of protection and the category in accordance with the criteria of the International Union for Conservation of Nature (IUCN). We differentiate among large (national, regional, landscape parks) and small (strict nature reserves, nature reserves and natural monuments) protected areas, where prescribed protection regimes apply. There are currently 1 national park, 3 regional parks, 43 landscape parks, 1 strict nature reserve, 51 nature reserves and 1185 natural monuments in Slovenia, which are protected by state or municipal acts. Register of protected areas, Environmental Agency of the Republic of Slovenia, 2008. To increase the proportion of protected areas of various categories by 5% (Resolution on National Programme of Environmental Protection Plan 2005-2012; OG of the RS, No. 2/06) up to 17% of the Slovenian surface area. Slovenia is rich with an exceptionally variegated landscape, varied plant and animal diversity and most of all with people, who foster a lasting relationship with nature and who long ago came to the fundamental realization and awareness of the inevitable co-dependence between man and nature. Designated protected areas are among the most important (and oldest) mechanisms for preserving plant and animal species as well as their habitats. 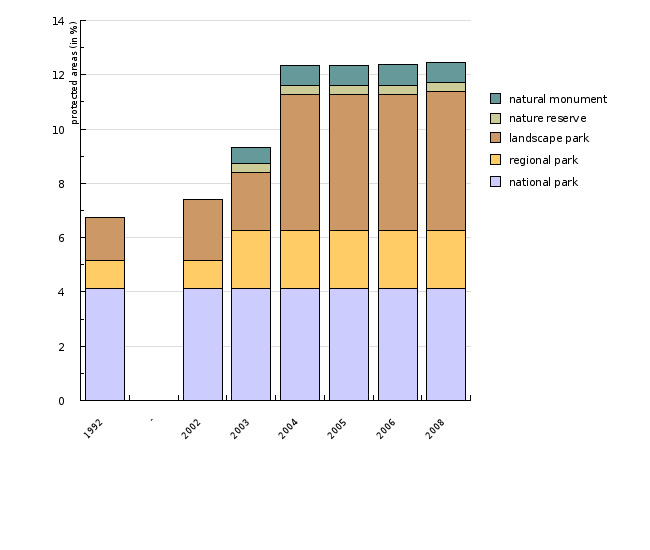 Data for the period up until 2004 show a continued increase in the share of protected areas. An important portion of these areas is covered by the Triglav National Park, the only national park in Slovenia, declared in its current size already in 1981. The increase in the protected surface area in recent years has mostly been due to the proclamation of two larger parks, namely the Notranjska Regional Park in 2002 and the Goričko Landscape Park in 2003. Since 2004 the share of protected areas has remained virtually unchanged. According to data by the Ministry of Environment and Spatial Planning two further parks are in the final phase of establishment, namely the Landscape Park Ljubljansko barje and the Regional Park Kamniško-savinjske Alpe, targeting to preserve the favourable condition of rare and threatened species and ecosystems as well as to ensure further sustainable development of the area by connecting and directing various activities, i.e. by actively managing the area. The proclamation of both parks (probably already in 2008) will lead to an increase in terms of protected areas in Slovenia for by over 2 percent. Protected areas partially overlap with the Natura 2000 protection areas. They encompass a smaller surface area than the Natura 2000 sites, although they are organized to a higher level with elaborated management plans and appointed managers. Data on protected areas are managed in the database Register of protected areas by the Environmental Agency of the Republic of Slovenia, the Nature Conservation Sector on the basis of Article 111 of the Nature Conservation Act (ZON-UPB2, OG of the RS, No. 96/04) and Article 105 of the Environmental Protection Act (ZVO-1-UPB1, OG of the RS, No. 70/2008).